Gonet is a very old name in Champagne. The family moved to Champagne from Beaujolais in the 15th century and worked in the vineyards before establishing a Champagne house in the early 1800s. 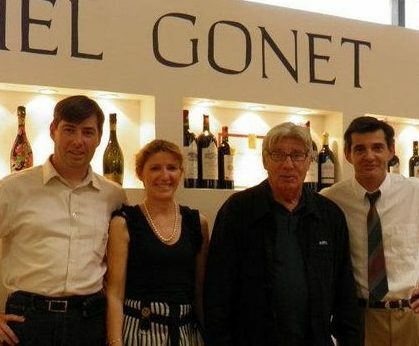 Each subsequent generation laid the foundation for a successful domaine with the most recent, Michel Gonet, enlarging the cellars in Avize and refocusing their winemaking in the 1970s. The total holdings are around 40 hectares, consisting mostly of Chardonnay (80% of the total holdings are planted to Chardonnay with the remainder Pinot Noir) on the Côte des Blancs. The vines are located in the villages of Oger and Le Mesnil on Ogera little further south, in Vindey on the Sézannais hillsides, but also near Troyes, on the slopes of Montgueux. Their Pinot Noir is in Fravaux, on the hills of Barsur Aubois, in the south of Champagne. There are a bunch of Gonets producing Champagne so it’s a name people are familiar with – i.e. Gonet Medeville, Philippe Gonet, Gimonnet-Gonet. Champagne Michel Gonet’s wines have also been on the market before and will continue to be outside of this particular cuvee. Having over 40 hectares planted, Champagne Michel Gonet produces over 10 cuvées. This particular one is the result of a philosophical partnership between Marco Pelletier and the Gonet family. Marco is working with them to further raise the quality level of their wines. The ’11 is the first release vilified under a new regime and from one of Gonet’s most historic parcels: Les Hautes Mottes.